Outdoor space shouldn’t be boring. If your home has outdoor living space and if you’re planning to sell your condo or townhouse this summer, don’t forget to spend some time staging the outdoor spaces. Buyers don’t focus just on interior spaces, they will be thinking about how they can use the home’s outdoor space. Whether you have an intimate balcony or large patio or courtyard, its easy and inexpensive to increase the appeal of your outdoor space. Create a seamless flow from indoors to outdoors – a weather resistant area rug on the deck or patio in a similar color or texture as the room leading to the outdoor space will make the interior/exterior areas feel connected and draw attention outside. Make the space comfortable – outdoor furniture doesn’t need to be expensive but should be comfortable and welcoming. Add colorful seat cushions and pillows to existing furniture or invest in outdoor chairs and sofas that fit your current space and can move with you. For open houses, place a bouquet of fresh flowers on the patio table or a pitcher of ice water and glasses. High tech your deck – wireless speakers and solar USB charging stations are affordable and make outdoor spaces functional for both connectivity and entertainment. Set the mood – lighting doesn’t just improve the ability to use outdoor space anytime, it also creates a festive mood. Place solar lighting along pathways or on tables and, if the HOA permits, hang fairy or string lights on deck railings or landscaping. Unique outdoor features – add a water feature, unique, colorfully planted pots, propane heater or small fire pit (there are also table-top versions), dog lounge space or grassy pet potty area. Large or small, show buyers the value of your outdoor space and the variety of ways the space can be used. Not moving . . . these are great ideas to enhance your outdoor spaces for your own use this summer. The long awaited Ben & Jerry’s shop is open at Bellevue Square in the former Baskin-Robbins space. The shop will be dishing up ice cream and non-dairy treats offered by the scoop (or two) and by the pint for take-home enjoyment. Don’t wait for the next 80 degree day (and undoubtedly long lines) to visit and welcome Ben & Jerry’s to Bellevue. Register early for this year’s Aegis Bellevue Four on the 4th dog jog/walk. This is a fun, non-competitive 4K dog jog/walk which benefits the Seattle Humane Society. The event starts and finishes at Ashwood Park with refreshments, activities and a dog costume contest. This event has grown in popularity over the years with hundreds of dogs and their owners participating. There are some rules . . . friendly leashed dogs and their people are welcome, no dogs in heat and leash length no longer than 6′. Water bowls are available along the walking route and refreshments for dogs and people are available after the walk. Early registration and more information is available through the Bellevue Downtown Association (bellevuedowntown.com) – use the promo code BDA2016 for a $10.00 discount (promotion expires June 13th). In this fast paced real estate market, there will occasionally be a condominium unit or community that seems to languish on the market. While condition and location are obvious elements that impact value and buyer desirability, there are other factors that owners have little control over that may impact resale value. Overly Restrictive Pet Rules – many HOAs permit pets with realistic restrictions on the number of pets per home, size/weight and sometimes breeds. If your HOA bans all pets, or just dogs, that can narrow the window of buyers. Be up front about pet policies when listing your home for sale. Parking – a condo with no assigned parking or that is difficult to access, is unsecured or uncovered,may have a more difficult time competing in the market. Your condo may have a better view or higher quality upgrades, but if there’s no parking the value may need to be adjusted to overcome parking objections. Sometimes there are owner spaces available for rent – be sure potential buyers know about that option. Unusually High HOA Dues – unlike a house, when buyers apply for a loan to purchase a condo, the lender includes the monthly HODs in the buyer’s loan qualification calculations. 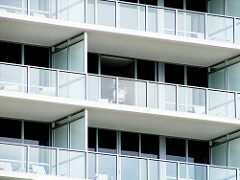 The buyer may qualify to purchase the condo, but not qualify for the mortgage plus monthly HOA dues. If the monthly dues are on the high side, and there aren’t amenities or upgrade plans to justify the figure, it may take longer to find the right buyer. Provide detail of all the amenities and services included in the HODs as well as any future capital improvements planned. High Non-Owner Occupancy Percentage – buyers, especially those planning to occupy the condo, prefer to invest in a community where there is stability with more owners than renters occupying the homes. And though rental caps are more difficult to enforce, lenders also like to see at least a 50% owner occupancy, or higher, in communities where they’re planning to lend. HOA Litigation – just about any condo community built in Washington State since July 1990 has gone through litigation with the developer over defects or warranty issues.That process can take years to resolve, leaving unanswered questions regarding defects, repairs or future special assessments. Buyers are less likely to assume the risk and few lenders will approve a loan in a community until the HOA resolves the litigation. Its difficult for sellers to control or change some elements that can impact their home’s value. As a seller its important to be educated about what’s happening in your community and how the HOA and Board are handling issues that impact all owners. Before you list your home for sale, know what’s happening in your community. The more you know, the more information you can provide to buyers and real estate brokers, potentially eliminating or resolving perceived negative issues that could impact a sale or market value. The 30 year vision for Bellevue’s Downtown Park is finally scheduled to be completed this year. Along with completing the circular promenade, the existing children’s play area will be expanded and replaced with an “Inspiration Playground”, a play area designed to accommodate children of all needs including those with development, physical, cognitive or sensory disabilities. The playground is funded in a partnership with the Bellevue Rotary. The southern half of the Downtown Park will close in mid-July for construction and completion of the circular canal and tree-lined promenade. An enhanced entrance and water feature will be created at the south entry to the park along with terraced seating, stairways and pathways and enhanced landscaping. Parking will be revised as well, removing the current parking lot off NE 2nd Street and expanding the parking area off 100th Avenue NE. The Downtown Park is similar to New York City’s Central Park – it’s an incredible feature for residents and visitors and an asset to a city that continues to grow and be a great place to call home. While the number of condos sold increased just slightly the first quarter of this year compared to the same period last year (40 in 2015 – 46 in 2016), median sales prices are up significantly . . . nearly 20% this year vs. last. Statistics for April reflect a continuing trend of fewer condos coming on the market, multiple offers, homes selling quickly and sales prices at or above list prices. 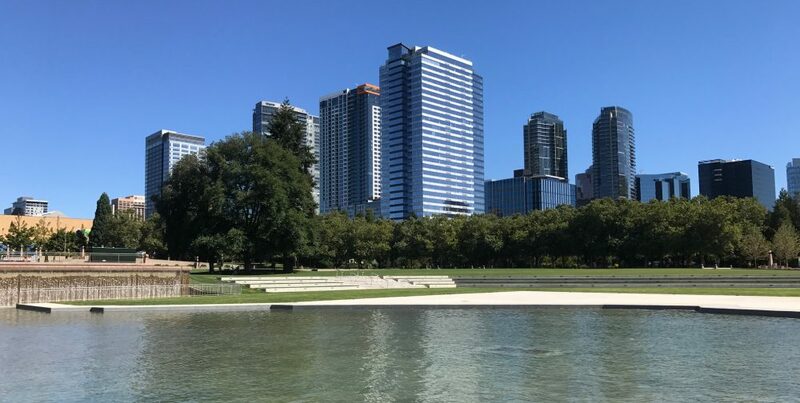 Of the 46 condos sold in downtown Bellevue the first quarter of this year, 29 sold at or above the list price and most sold in ten days or less. The new downtown Bellevue post office won’t be in downtown Bellevue. Replacement of the existing tired and outdated Bellevue post office is long overdue. While several potential downtown locations were mentioned in recent years, the site selected for the new “downtown” Bellevue post office will be east of I-405. Interior renovation is nearly complete on an existing building located at the southwest corner of Bel-Red Road and 124th Avenue NE. Though a bit of an eyesore, I’m definitely going to miss the convenience of having a post office within the central business district.